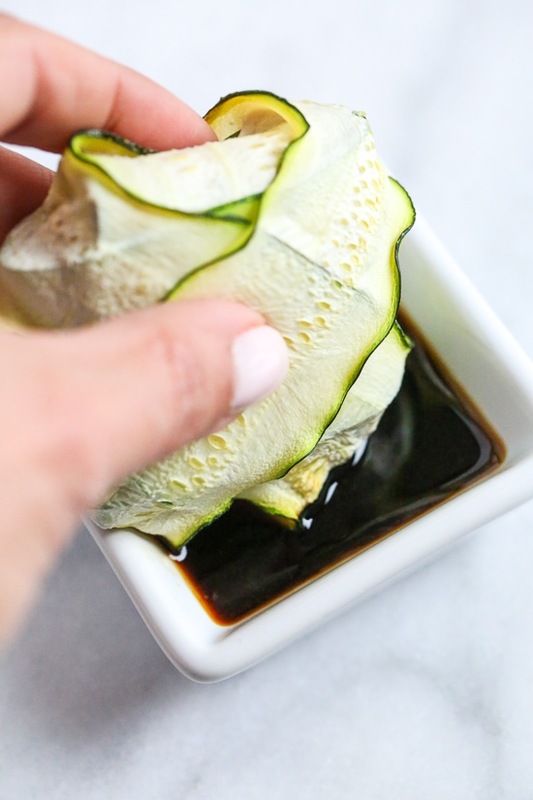 These low-carb pork dumplings, made with zucchini in place of dough are so dang good, you won’t miss the carbs! They are also keto, paleo, gluten-free and whole30 friendly! You can make them as an appetizer or have them for dinner with some brown rice or spicy garlic edamame on the side. 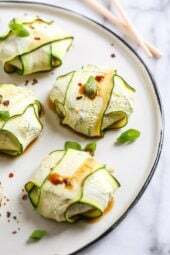 I love using zucchini in place of pasta or noodles, as you may have seen in zucchini lasagna and zucchini rollatini, so I knew I would love this! 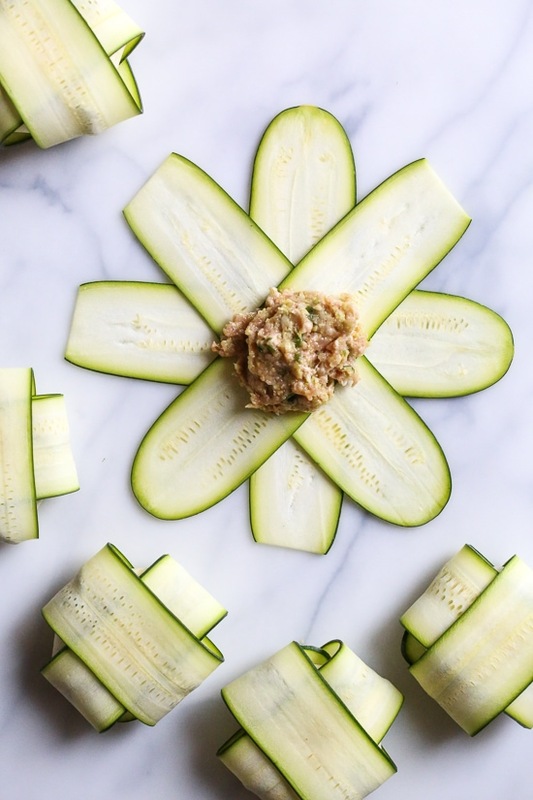 This creative recipe is from friend Ali’s new cookbook, Inspiralized and Beyond (affil link). It’s loaded with paleo, vegan, vegetarian, and gluten-free recipes for vegetarians and meat-eaters. Her book is filled with tons of great recipes like this, it’s a must to add to your collection. You will need a mandoline to slice the zucchini, this is the one I have (affil link). 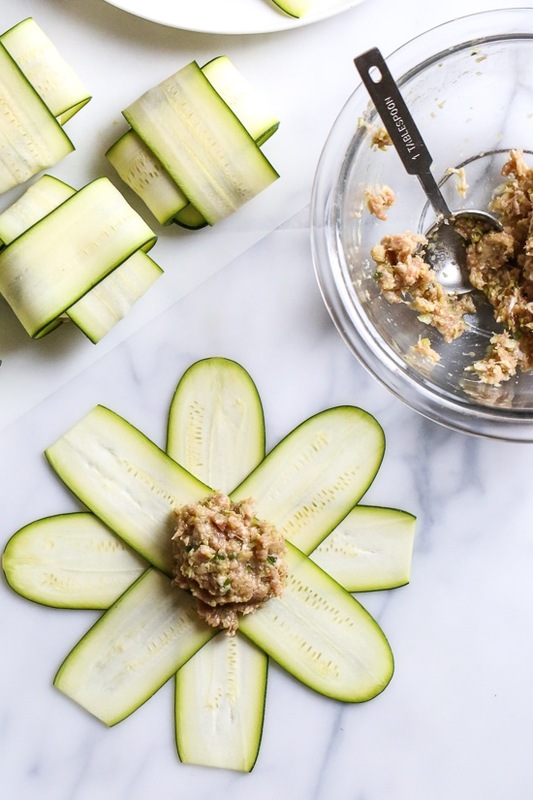 Use zucchini that are 1½ inches in diameter so that the zucchini strips are large enough for wrapping the pork filling but small enough to remain dumpling-sized. Each zucchini should yield enough noodles to make 4 dumplings. You can swap the pork for ground chicken. In a food processor, add the cabbage and pulse until finely minced. 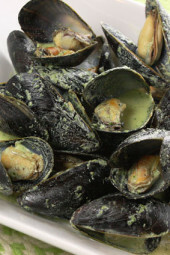 Set aside on a large, thin kitchen towel in the sink. Sprinkle with salt and let stand for 10 to 15 minutes. Wrap the cabbage up in the towel and wring out excess moisture over the sink (should eliminate about ⅓ cup of moisture). Set the cabbage aside. Transfer to a large bowl and add the cabbage. Mix together with your hands to combine thoroughly. Set aside. 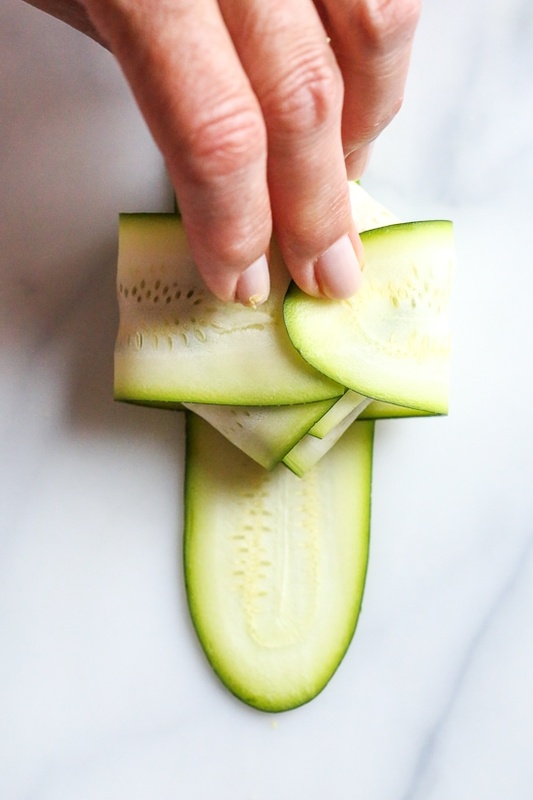 Using a mandoline, slice the zucchini into 1/16-inch-thick strips. Set 1 strip down and then set another one down on top of it to create a cross shape. 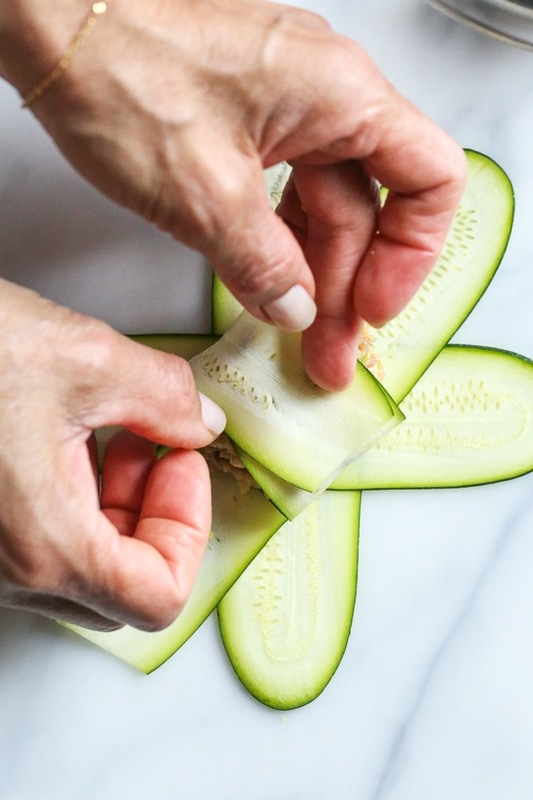 Repeat with 2 more zucchini strips on an angle to create an 8-cornered star shape. Spoon about 2 tablespoons of filling onto the center of the zucchini star. 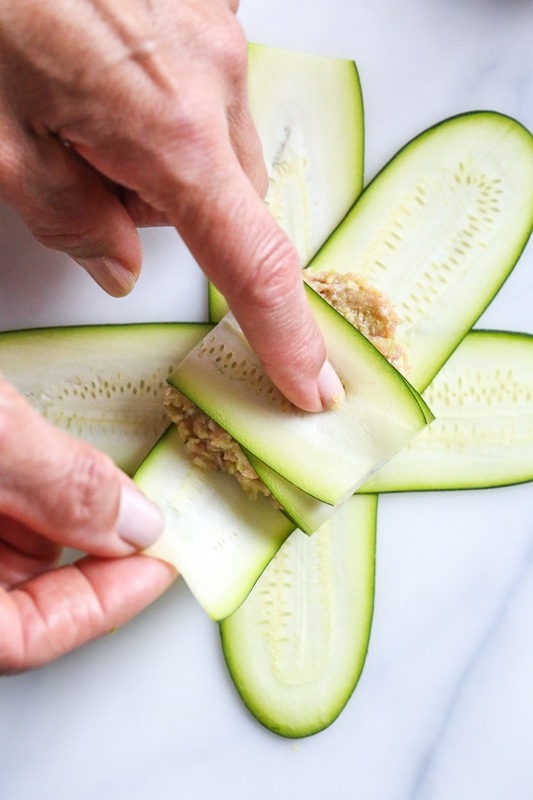 Bring the ends of the zucchini together, laying them over the filling. Flip the dumpling over so the seam side is down. 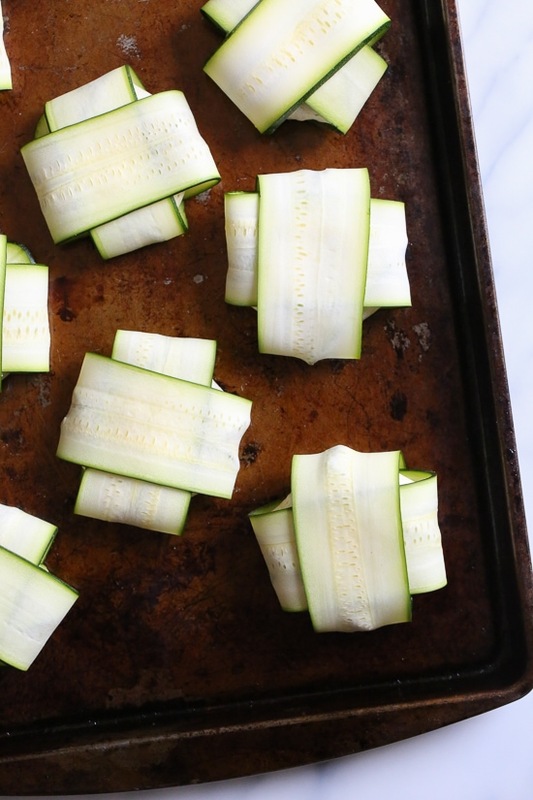 Arrange on a baking sheet and repeat with remaining zucchini strips and dumpling filling, lining them up on the baking sheets as you go. You should create 18 to 20 total dumplings. Bake for 15 minutes, or until dumplings are firm and edges start to brown and crisp up. 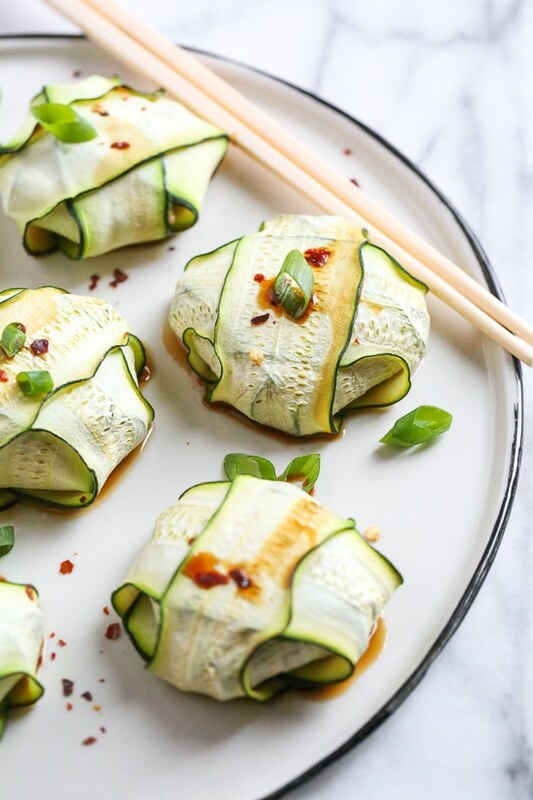 Transfer the zucchini dumplings to serving platters, and sprinkle with green onions and red pepper flakes. From the Inspiralized and Beyond Cookbook. Mine are in the oven right now! Can’t wait to taste them. Had some trouble wrapping them… after reading comments I believe my zucchinis were not long enough and also a little too thick. Nextime gonna get longer zucchini and try either the veggie peeler or may grill a bit to soften… I’ll get back to ya after I taste them. 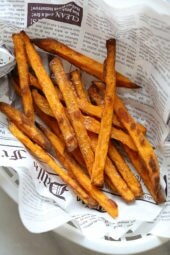 Could you make these in an air fryer ? These were amazing! I am midway through Whole30 and this was a delicious change of flavor pace. And my 10 year old loved them as well. Just made these! LOVE THEM. Had plenty of zucchini left over to add to another recipe tomorrow! Awesome and healthy date night dinner with the hubs! Do you think these would hold up as leftovers to warm up in the microwave? Would this still work if you didn’t use a food processor and just hand mixed the ingredients? Thank you. I didn’t have a food processor and just hand chopped and blended them-worked great! She’s in the US so Fahrenheit. I think a 400 degrees Celsius oven would burn everything. The flavor was very good but I found these hard to construct and keep together. Perhaps I will try what another reader did above and bake the zucchini first to make them more pliable. Made these tonight & they were delicious. I have a mandoline but was not excited about getting it out & cleaning it so I used my peeler. It worked like a dream! I halved the zucchini lengthwise & ran the peeler across the middle. Thanks! I love these! Great flavors and oh so healthy. My only edit for next time will be to dry out the zucchini before use – slice, then maybe sprinkle w salt, let stand for a few minutes, and pat dry. Basically do the same thing w zucchini as the recipe calls for the cabbage. My dumplings turned it way too moist and watery bc of the zucchini. Something that can be fixed and perfected for the next go around ? Made this and it was a huge hit with the family. Delicious! I cooked the squash for about 5 minutes in the oven so they were flexible to make the dumplings. I had no trouble with slicing the zucchini with a mandolin. For sure I will make this again. Loved it. Thanks so much! Making these tonight. Did you prep the baking pan with anything like oil or cooking spray to prevent sticking? Just made these and they were OFF THE CHARTS AMAZING. I added a quail egg for some extra protein (and tobc I had a whole cartoon and didnt know what to do with them! ) Served brown rice with peas as side dish. It was smiles all around the dinner table!!!!! This was delicious, BUT I had THE hardest time getting the zucchini to slice on the mandolin. I have an Oxo. I ended up slicing by hand and only used two slices of zucchini on each dumpling. Still they were awesome and they looked pretty good too. I can’t wait to make these! I am also going to try to shred the zucchini with yellow squash and daikon to make my “dumpling”! I’ll let you know how it comes out! I wonder if I added too much cabbage to mine? Hard to judge 12 ounces. I thought they were a little bland and I added extra soy to the mix. These are so CUTE! And I love cute food. 🙂 What a creative idea. The filling in these is great, but I had a terrible time with the zucchini strips and ended up making meatballs instead. I kept getting half strips and pieces with my OXO mandoline. I tried cutting the zucchini in half lengthwise to give me a flat surface to work with but it wasn’t much better. After reading the above comment my zukes probably weren’t long enough. Any tips on cutting the strips? Not sure why it was hard to cut, I had no issues. Perhaps yours were not straight? They didn’t look that crooked, lol, but maybe they were. I’ll have to try again cause I love the idea. Made these tonight and they are delicious. My only suggestion is to pay attention to the length of the zucchini. Mine ended up being a little short to hold 2 tbsp of the pork mixture. I used less filling so I could comfortably fold over the zucchini and still be able to flip it over without it all coming apart. Enjoy! Any ideas on vegetarian filling? Mushrooms, garlic cabbage, carrot? Thoughts? I make a delicious vegan macadamia but cheese. I’m going to try that inside!! I don’t have the mandolin and really don’t want to buy one 🙁 Something else taking up space in my tiny kitchen lol! Is there anything else I can use to achieve the same result??? Your recipes are so good Gina – I introduced my mom to so many of them, the 2 ingredient dough is her go-to now! My dad passed away last year so she is cooking for one. She also loves your creamy zucchini soup! You can try a potato peeler? No. You need a mandolin for a recipe like this. At least a very, very sharp knife that will slice thin and uniform slices for you. You can find cheap and small mandolin slicers at stores like Homegoods. I bought my first one for about $15 and it fits in my silverware drawer, over top of the big soup spoons. I really didn’t think it would get much use, but it does and we love it. If you have an old style box grater, or a multi grater with a slicing cutter it will work. Also there are vegetable peelers that are used for decorative garnishes that will give you the right thickness. A good vegetable peeler is only $10 or so and would work better than a potato peeler imho. 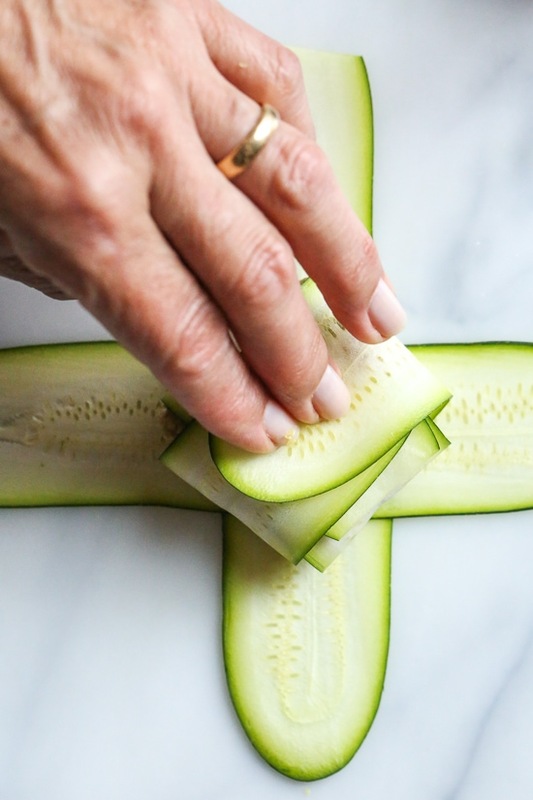 Place a skewer through the center lengthwise to hold it steady as the peeler is really sharp. Below is a link to the one I use. Actually mine is similar but doesn’t Julienne. I use it to shave parm, peel winter squash and make ribbons. It’s so worth buying an inexpensive mandolin because there are so many other zucchini recipes you can make and will need a mandolin. Such as zucchini lasagna, zucchini ravioli, zucchini roll ups. Also you can use it for potatoes, carrots and so many other vegetables. Any suggestions if I don’t have a mandoline to get this zucchini slices? I don’t have a mandolin and I used a vegetable peeler, it worked great! I wonder how I could affix the zucchini such that these could be used in a soup as a wonton. Any ideas anyone? Maybe you could tie it up w/a few pieces of string from celery. 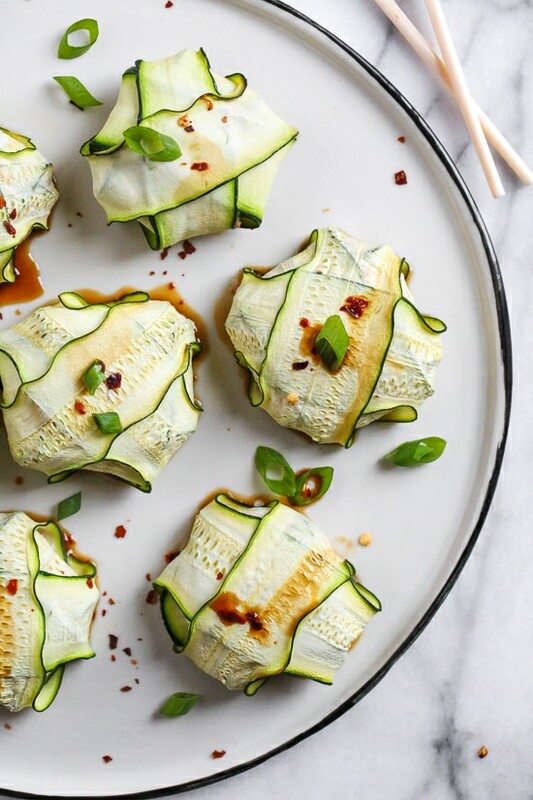 I think you could just drop the dumpling filling in without the zucchini wrapper. Not sure if that ruins it for you. But you’d have the flavor from the dumpling meat, and it’d be like italian wedding soup or a meatball soup. Just with dumpling meat! LOVE all of your zucchini recipes, keep them coming. Cant wait to make these this weekend. I know I’ll love them. Thank you!! Thank you for sharing, lady!! Is the one tablespoon of rice wine supposed to be rice wine “vinegar”and if so, is it regular type or seasoned? Wow! I am going to make these this weekend! I am hoping the ribbon setting on my spiralizer will do the same trick as the mandoline. The possibilities with this recipe are exciting too. Think lean ground turkey with Italian seasoning and then using a marinara sauce for dipping! Thanks! Shirl. 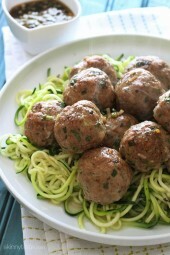 Did you try this recipe with the spiralizer? OMG! I adore this idea!!!! so creative! Please let us know how it goes! I am interested as well! Did you ever try them in the air fryer? I would love to know bc i use my air fryer all the time. YAY!!!! Thank you Gina and Ali! Yummmm. I’m dumpling obsessed. Think you could use ground turkey or ground shrimp to reduce points? Do you think I can substitute ground chicken for the ground pork. I don’t eat pork. Love your recipes. Do you think these could be frozen? Or would the zucchini become mush after thawing? Do you know what the points would be if you replaced the pork with ground chicken? 1 point for the whole serving size? Must be, right? Since 5 pork ones are 6 points?